Network devices are always associated with a configuration file which serves as an identifier/handle for a particular device. The configuration file is device specific and is saved in $HOME/Applications/Network/config/. The user can start start/stop/configure network devices via the Internet application. Network related application can start and stop the device via QtopiaNetwork::startInterface() and QtopiaNetwork::stopInterface() respectively. If the Qtopia device has more than one device online at a time the default gateway can be set via QtopiaNetwork::setDefaultGateway(). 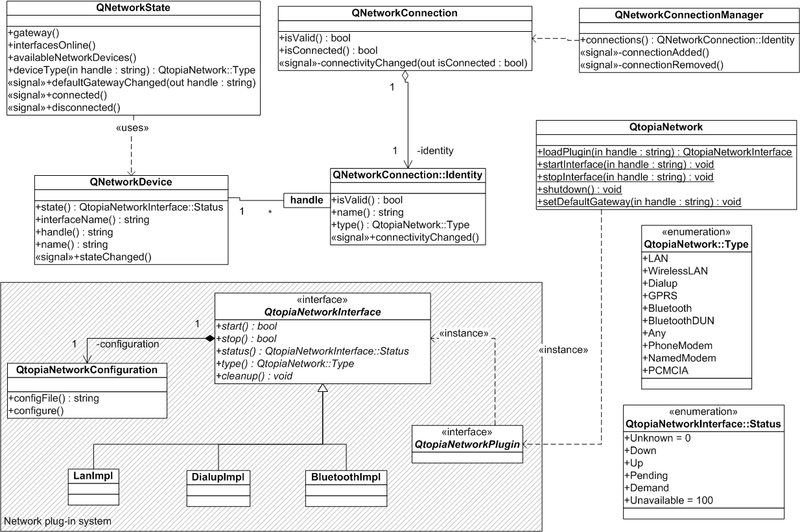 The following UML class diagram displays the general interaction of Qtopia's network API. Qtopia keeps track of network devices with the help of a session manager. If an application starts a device the session manager records the identity of the application and will close the device if the application doesn't stop the device before it quits. If several applications requested the same device the device is closed when the last remaining application closes the device. Hence every application should call QtopiaNetwork::startInterface() no matter whether the device is active already as this call creates a new session for this application. Note that a device which has been configured to use an internal timeout (e.g. timeouts of dial-up connections) may still stop when the timeout is triggered.